Pablo Nunez, the conference organizer and an interpreter, took us (Andy Maloney and me) to the newest federal forensic laboratory in Argentina. The laboratory is a spacious facility both in terms of current working space and room to expand. While it is referred to as a chemical laboratory and that type of analysis is done there, other disciplines including DNA and crime scenes operate out of that building. We had no idea what to expect other than a tour of the facility. Shortly after our arrival we found ourselves seated at a table speaking with not only the two directors of the facility but also with Comisario Mayor (Senior Commissioner) Javier Meregallit, the Director of all PFA Forensic Labs in Argentina! All of the Argentine officials were wearing suits and ties and we were casually dressed. Our guests made us feel most welcome and we were comfortable. We also saw the exterior of Casa Rosada, which is on the east side of the Plaza de Mayo. Casa Rosada is considered the center of Argentina’s government. It was at one time the largest building in Buenos Aires. Tourism sources state the pink color was chosen as a means to attempt political harmony. Our local hosts told us the building at some point was painted with pigs blood by one of the country’s leaders many years ago. The pink color was a means (also) of hiding the blood. It sounds as if it could be the world record for a bloodstained area! There was a national strike this Monday, so our walking tour of part of downtown was relatively free of crowds and traffic. One downside was that many restaurants were closed and many taxis were out of service. We walked around the Plaza de Mayo, which has been the center of Buenos Aires since it was founded in 1580. 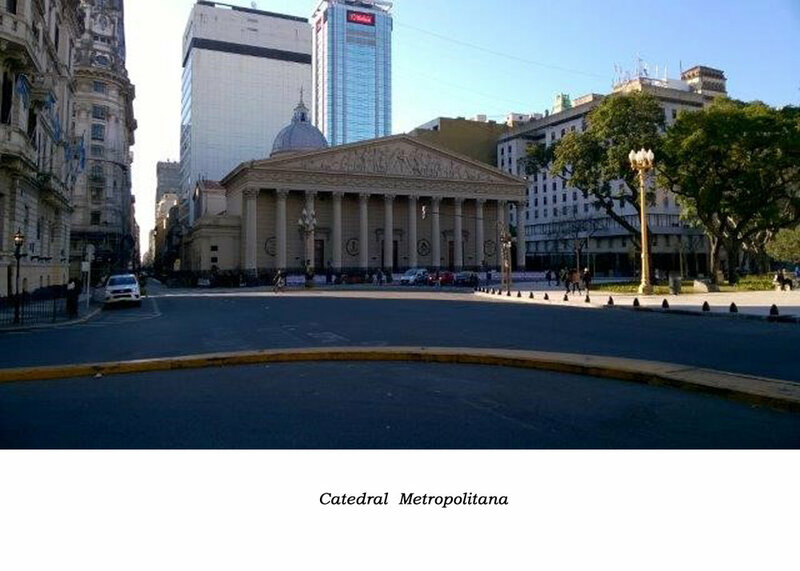 One of the sites was the Catedral Metropolitana, Argentina’s main Catholic cathedral. This was the church where the current pope spent much of his religious life while he was in Argentina. It was built in 1580 and has undergone renovations several times since then. We visited the site of the conference (or congress, as it was called) so as to see the main presentation room and the rooms which would house the Friday workshops. Late in the afternoon most of the speakers went on a guided tour of the federal congressional building. We were able to walk into the congress room and be within a few feet of the desks at which the representatives sit while in session. That is something that could never happen at the U.S. Congress or did not happen the last time I participated in a tour of that building. At one time this building also housed a copy of every book published in Argentina. Those books now reside in a library near the congressional building. Lunch was provided for the staff and speakers. Two of the presenters after lunch had attended BGA BPA classes. These were Christina Vazquez (Salt Lake City in 2017) who offered a case presentation and Soledad Aldao (Baton Rouge in 2014) who presented her study on stringing areas of origin for impact patterns. The conference resumed at about 8:30 a.m. with both cases and research presentations. 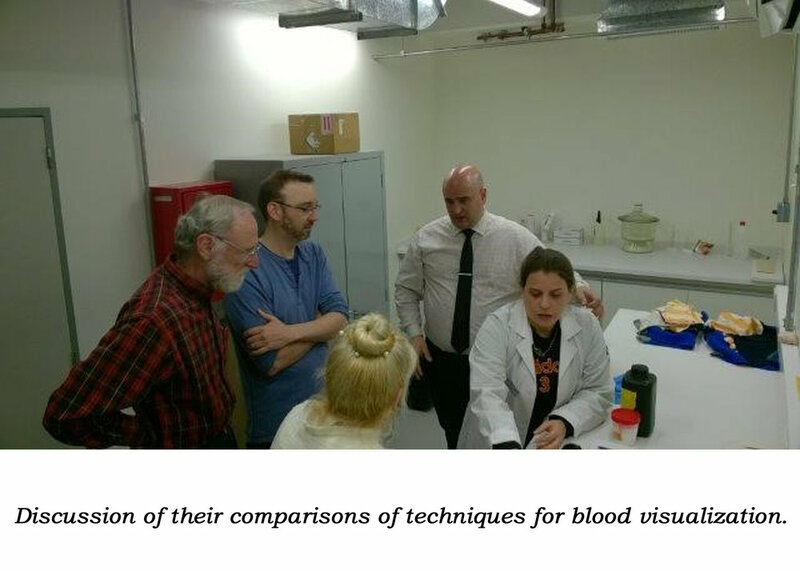 I had the last presentation of the day showing case applications of bloodstain pattern analysis. The conference closed at 6:50 p.m. The final day of the conference opened with Andy Maloney talking about the 2018 IABPA conference to be held in Ottawa, and Philippe Esperanca telling the attendees about the IABPA. I lectured about BPA on clothing, which served as preparation for my workshop that day. After a vendor break, the first workshops began at 11:00 a.m. The timing of the lunch break was up to those of us conducting the workshops. The workshops continued the rest of the afternoon until about 6:00 p.m.
One of the workshop participants was Patricio Leyenda (shown wearing the blue and black striped shirt). He attended a BGA BPA class in Colorado Springs June 2018. There were six teams involved in the clothing workshop and each team moved to a new set of clothing and case scenario after completing examination and documentation of one of the six sets. Every team wanted a group picture at the completion of its last assignment. At the end of a long day, these team photographs took on a less serious approach as one can see in a couple of the team photographs. I had to step away from the workshop for a brief interview with an Argentine journalist for which Soledad served as the interpreter. The participants assembled in the main room at 6:30 for the official wrap up of the conference. Several group photographs were taken at this time. We did some last minute sight-seeing on Saturday prior to going to the Buenos Aires airport. Two of us heading home to the U.S. had to deal with the airport being shut down for a few hours due to fog. I was lucky in that my flight wasn’t cancelled, but its departure was delayed about five hours. That meant missing my connecting flight in Houston on Sunday morning. However, the airline did secure a seat on a flight in the middle of the afternoon. When the adventure was over I had spent about 30 hours traveling to get back home! My thanks to Pablo Nuñez for most of the photographs presented here.